Monuments Sight Seeing Attractions Greece Catacomb is the Arab translation of the ancient Greek name, Lofus Kiramaikos which means “mound of shards” or “potsherds”. Located to the southwest of the Pompey’s pillar is a multi level labyrinth featuring dozens of chambers adorned with sculpted pillars, statues and other Romano Egyptian religious symbols, burial niches and sarcophagi as well as a banquet room of Roman style, where memorial meals were conducted by relatives of the deceased. Many of the features of the necropolis merge both Roman, Greek and Egyptian cultural points, due to the time period. So some statues are Egyptian in style, Roman clothes and hair style whilst other features share a similar style. During the age of the Antonine emperors a circular staircase used to transport deceased bodies down the middle of it, leads down into the tombs that were tunneled into the bedrock. So its easy access was then used as a burial chamber. According to tradition, this is a mass burial chamber for the humans and animals massacred by order of the Emperor Caracalla, so this is one of the more gruesome features of the catacombs, called Hall of Caracalla. Located in Rhakolis a fishing village in the old part of Alexandria City in Egypt; the catacombs survived due to its advantageous location to the historical turmoil taken place during the past centuries has either eliminated much of the rich monuments. The underground tunnels dates back to the 1st century AD and was used until the 4th century AD. On 28th September 1900, according to popular belief, a donkey cart fell into a pit which led to the discovery of the catacombs. But the reality is that Said Ali Jibarah, an Alexandrian man, was quarrying for stone when he broke open the vault of a subterranean tomb. Probably the catacombs were used for a single wealthy family as a private tomb and later converted to a public cemetery. They are composed of a three levels; the first level consists of a vestibule with a double exedra, a rotunda and a big dinning-table with chairs at three sides (triclinium), including a platform for funeral rituals; in an original state, the second level was the main tomb with various surrounding corridors, magnificent statues, decorations on all proper places, images, ornate carvings and practically everything needed for a funeral hall; the third level is submerged in ground water, also saturated with sand. The large number of grooves cut in the rock is known as “loculi”. The complex contained over one hundred loculi numerous rock-cut sarcophagus tombs, in its final stage. Representing an integration of the cultures and traditions of the Egyptians, the cemetery is unique both for their plan and decoration. People seemed to have a talent for combining rather than destroying, so in this place we find decorations related to ancient an Egyptian theme which makes them quite unlike anything in the world. 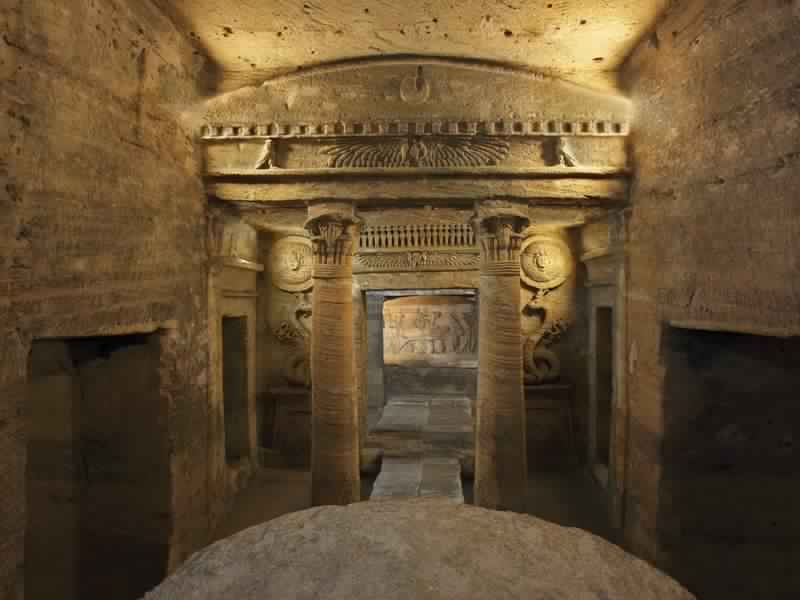 The Catacombs of Kom el Shoqafa may not be as famous or visible as the Pyramids but they are equally astonishing and perhaps more intriguing than the Pyramids. In olden days Christians of the Roman Empire this subterranean funeral halls were resorted to bury their dead and evade desecration by the oppressive regimes. Kom el Shoqafa structures were Pagan sects. The members of the Pharoah-Cult placed the intact dead bodies in this place because they believed in rebirths. Considered by archaeologist and all who love their heritage and history, a real treasure by its scripts written, the motif, the engravings, statues and even the coffins. In a sense catacombs were an escape to the oppressed and the hunted to preserve their rituals and heritage.